Provide comfort for the family of Ryan Uhuad with a meaningful gesture of sympathy. 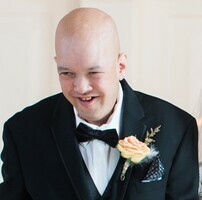 Portland – Ryan Scott Uhuad, 43, passed away peacefully surrounded by his loving family on Thursday, April 11, 2019, at his home in Portland. He was born on December 29, 1975, in Farmington, Maine, to Generoso “Gene” and Cheryl (McDonald) Uhuad of Jay. He was a 1995 graduate of Jay High School. Ryan will always be remembered as a gentle giant, a passionate fan of McDonald’s hamburgers, and an elaborate story teller. He was also an avid bowler, gameshow enthusiast, and lover of pop music. He loved spending time with his family and helped those around him appreciate the little things in life. Ryan is survived by his parents, Gene and Cheryl of Jay; his brother, Randy Uhuad and his wife, Betsy of Saco; his sisters, Ashley (Uhuad) Roy and her husband, Alex, and Kristen (Uhuad) Hewitt and her husband, David, all of Marion, MA; maternal grandmother, Marguerite McDonald of Jay; nephews, Hunter and Henry Uhuad, and multiple aunts, uncles, cousins, and his dear friend, Mary Dunlap. Ryan is predeceased by his maternal grandfather, Carroll McDonald, and paternal grandparents, Jose and Maxima Uhuad; uncles, Domingo and Jose Uhuad; and cousin, Jennifer McDonald. The Uhuad family would like to extend their sincerest gratitude to Ryan’s group home, Port Resources, for providing exceptional care, and for being a second family to Ryan. Messages of condolence may be sent to: www.finleyfuneralhome.com. To send flowers in memory of Ryan S. Uhuad, please visit our Heartfelt Sympathies Store. Visitation will be from 12-1PM prior to the funeral service. We encourage you to share your most beloved memories of Ryan here, so that the family and other loved ones can always see it. You can upload cherished photographs, or share your favorite stories, and can even comment on those shared by others. Provide comfort for the family of Ryan S. Uhuad by sending flowers. Heartfelt Sympathies Store purchased flowers for the family of Ryan Uhuad. I am so sorry to hear of the passing of Ryan. This gentle person will always hold a special place in my heart. I worked with Ryan while he was at Pathway's Inc. We held many laughs and special times. Ryan would quite often come in and tell me that I looked like Phyllis Diller and then laugh. He had such a contagious smile. My condolences to his very special family that cared so deeply for him. RIP Ryan love you. I was so sorry to read about Ryan’s passing today, I worked with Ryan for many years back when he lived in Minot, oh the fun we had, clapping, singing, watching game shows and he loved Connie Chung and Phylis Diller, you will always be in my heart buddy, love you forever. I have fond memories of talking with Ryan whenever I visited my brother, Bob Frechette, at Franklin Heights in Farmington. Ryan loved his music and his collection of special pens. Hw was a gentle soul. Rest In Peace, sweet Ryan!